LifePoint Health jumped 40% in after-hours trading Friday to about $67 on a report that the for-profit hospital chain may be acquired by a private equity firm. 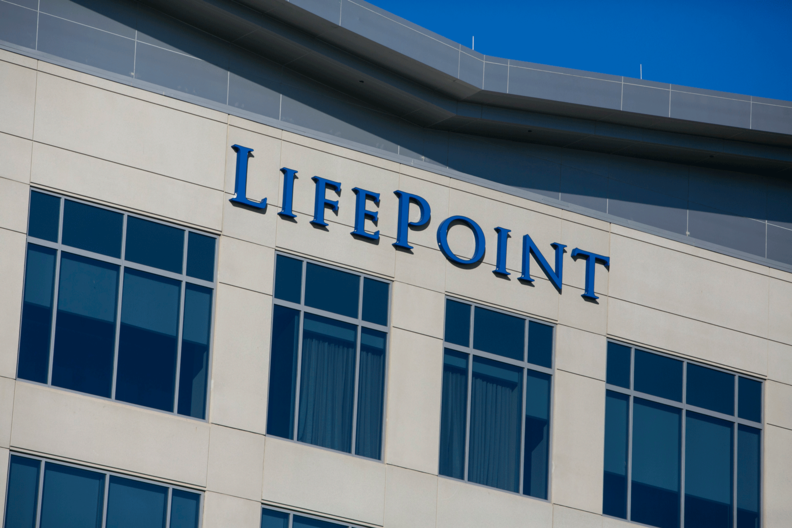 Apollo Global Management is in advanced talks to acquire Brentwood, Tenn.-based LifePoint, according to people familiar with the deal who spoke to Reuters. Reuters wrote that Apollo plans to merge LifePoint with another regional hospital operator it owns, RegionalCare Hospital Partners. Charles Zehren, an Apollo spokesman, declined to comment. A LifePoint spokeswoman could not immediately be reached for comment. LifePoint has struggled with sluggish volumes and ballooning costs at its 71 hospitals located in 22 states. The company posted a net loss of $5.3 million in the first quarter of 2018, down from net income of $64 million during the same period in 2017. Revenue fell 1.7% during that time, while expenses rose 4.7%. LifePoint's same-hospital supply costs as a percentage of revenue spiked 16.6% during the first quarter of 2018, and its inpatient surgeries fell 3% in the quarter. Second-quarter earnings are scheduled to be released July 27.